Between the prospect of an unshaven bikini line or a bikini trimmer that works well, things can get ugly. The bikini line is sensitive, that goes without saying. There are also a lot of products to choose from, but after discovering the Braun Silk-Epil ﻿9 I am very impressed and my search for an excellent trimmer has ended. Let me share t my embarrassing story on the road to discovering the Braun Silk-Epil 9. I had always had problems with growth in the bikini line area and battled to find a good way for long term maintenance. After trial and error with many different products, and covering up most of the time, I finally found the product that worked for me. The Braun Silk-Epil 9 is a bikini trimmer that comes with several other interesting features such as a facial cleanser, which was of a lot of use to me personally. To get into the specific technicalities of this product: The Braun Silk-Epil 9 uses what is called epilation via a tweezing motion. Epilation is just a process of removing the hair by the roots, much like waxing. Waxing isa bit notorious for how much it can hurt and is very messy, so I always avoided this method of hair removal. 1.4 How Does It Compare? For those who are used to waxing, the transition to epilation will generally be much easier. A product like the Braun Silk-Epil 9 has a wider head and can be used both wet and dry, but for those who aren’t used to tweezing or waxing, it might be a little harder to change over to this style of hair removal. This is a product for folks who want to get a lasting smoothness, especially if you have used epilation in the past. If you are the type who hasn’t tried epilation before, you need to know not to expect a pain-free experience initially. Over time a resistance is built up and the pain becomes minimal. Braun Silk-Epil 9The Braun Silk-Epil 9 is a bikini trimmer that comes with several other interesting features such as a facial cleanser which can be quite useful to people who need a lasting effect for their delicate facial area as well. 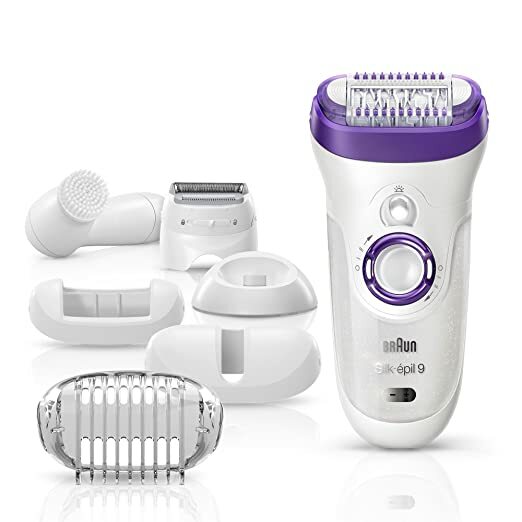 The Braun Silk-Epil 9 uses what is called epilation via a tweezing technology which is the process of removing the hair by the roots, much like waxing. Waxing is can be messy and painful, so I personally avoid this hair removal method. It is comparable to other products within the same range, such as the Silk-Epil 9 Wet & Dry SkinSpa, which comes with extra perks such as a sonic exfoliation brush, as well as the Panasonic Bikini Trimmer and Shaver. Ultimately, if you want something easier than waxing, this might be a perfect choice for you. It is preferable if you are already used to complete root extraction hair removal techniques as there can be some pain associated with the use of this product if you have not used this type of hair removal product before. Listed as being 40% wider than most models, this means that the trimmer actually covers more skin per stroke during use. For those who want to save time and pain, this is a definite bonus. Anyone who has ever tried dry ﻿shaving﻿﻿ knows the potential horrors involved. With the Braun, it allows for use with both wet skin (which is great for those who want to use it in the shower) and dry. If you have the same level of pain tolerance that I do, this feature would mean a much gentler epilation process, reducing the pain tolerance required and making for a more comfortable experience overall. The Silk-Epil Microgrip boasts that it can remove hair as small as “a grain of sand”. This would ensure a better all over hair removal experience and less need to grow the hair out for a while before using the hair remover. Phillips HP6401Phillips HP6401 — This is an epilator that appears to be quite friendly to sensitive skin. It is equipped with two-speeds and claims to remove hair for weeks at a time. If you have less time for hair removal or just want to be able to skip the potential pain for a while longer, then it would be great if it works as promised. The Satinelle also comes with the “efficiency cap”, which is said to make the epilation kinder on more sensitive areas. Despite also handling multiple hair lengths, the downside is that it does not seem to work with wet skin. Still, you may want to consider it if your skin is prone to high sensitivity. Emjoi AP-18 — The 72 in the name is the number of tweezer heads that this little machine touts. From my understanding, this negates the need for multiple passes or needing to use the machine multiple times in one sitting, all hair should be removed in one stroke. The Emjoi is made with the user in mind. The handle is ergonomic and there is an antimicrobial protection via silver ion technology for a safer experience. So for those who have wrist issues and need a comfortable hold, as well as something to protect their skin, this may very well be a good option. It does come with a 30-day money-back guarantee which does not compare with the warranties of 1 year with the Braun Silk-Epil 9 or the Satinelle. Finding the epilator that is just right for you is a worthwhile investment, it may take a bit of trial and error to find the one that perfectly suits your needs. In short, for those who have stubborn bikini hair or are looking to transition to epilation for all round hair removal, the Braun Silk-Epil 9 is worth a try. Left unattended the bikini line hair can lead to chafing, discomfort and needs to be kept in check to keep this area looking good. Your own pain tolerance levels as well as the hair removal methods you have used in the past will all impact on your experience with this product.